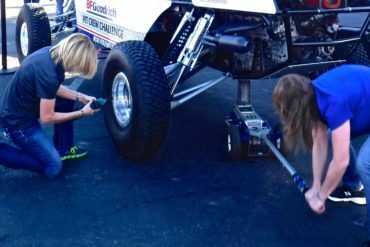 BFGoodrich Tires and Ladies Offroad Network have partnered to host a hands-on Ladies Offroad Tire Experience at King of the Hammers on Wednesday February 8th from 1-3pm at the BFGoodrich Tires Garage. Ladies will have the opportunity to use a jack, impact wrench, star and other tools to learn how to properly change a tire. We will be changing the tires on Frankie, the Jeep Charlene Bower used in the Ladies Co-Driver Challenge Trail of Missions and Rebelle Rally events. 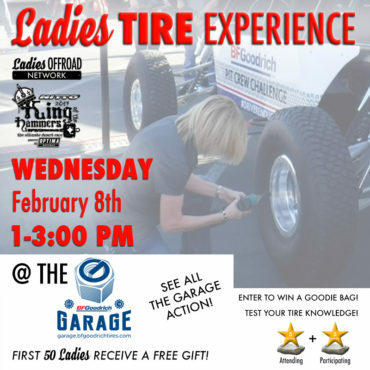 The first 50 ladies in attendance will receive a special gift from BFGoodrich Tires and everyone that attends will be entered to win a Bag of BFGoodrich Goodies and more.